Tarantulas (spiders in the family Theraphosidae) will emerge during the summer here in Tucson, Arizona. The tarantulas here spend most of their time in underground burrows, but during the summer, the males emerge after dark to look for females. Even though I have arachnophobia, I don't really mind Tarantulas too much. They are large, furry like an animal, very slow moving, mild-mannered, and do not come into the house unless you leave your doors wide open (which, given all the rattlesnakes and other creatures we have here in Tucson, would be an act of madness). Male tarantulas, in their quests to find a mate, are daring explorers and will climb things, so they can be found in all sorts of unusual spots. While some species of tarantula are very docile and make nice pets for anyone really wanting a pet spider, tarantulas are not without some formidable defenses. They have special, loosely-attached, highly irritating, urticating hairs on the top of the abdomen which they will brush with their legs if threatened. This causes a small, fine cloud of these hairs to be released, which can cause severe irritation to the mucous membranes of any mammal with it's face very close to the tarantula. 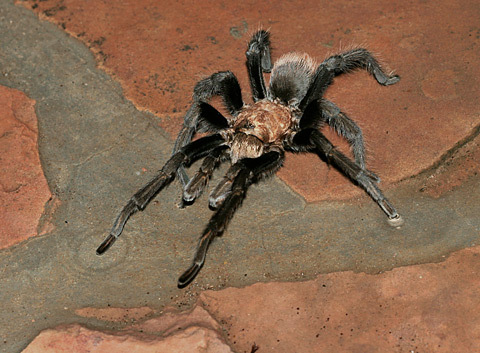 Tarantulas also have large fangs, and their bites can be quite painful, but not dangerous as the tarantulas here in Arizona are only mildly venomous. 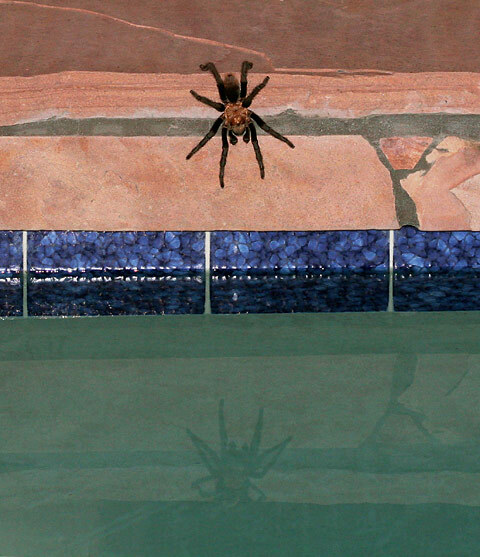 Luckily, tarantulas are not aggressive to humans and will only bite if handled improperly. I once helped take care of a pet tarantula, and when it ran out of little, pet store crickets, I captured a large grasshopper and put it in it's terrarium, which was a definite mistake. The large, heavy grasshopper began hopping around and kept landing on top of the tarantula, which greatly upset the poor tarantula. It crouched down and looked miserable until I removed the offending grasshopper. After that bad experience, the tarantula was terribly afraid of grasshoppers, and it would huddle pitifully in the corner or flee to it's little house if it saw one.